Picture this: the year is 1916. A sturdy Model T Ford is tooling down a dirt road leaving a cloud of dust in its wake. 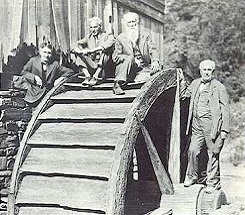 Riding in the car are Thomas Edison, Harvey Firestone, Henry Ford and naturalist John Burroughs. Following these men is a caravan of Model-T’s, some tricked out by Henry Ford himself, precursors to the camping van with camp stoves and ice boxes cleverly attached. From 1916 to 1923, (when the paparazzi hoopla got to be too much for the travelers) these four fast friends, occasionally accompanied by other industrialists and even presidents, took annual camping trips to a variety of locations across America. They called themselves the Vagabonds. Who were these men? Thomas Edison did not invent the light bulb, but he made it so that it could be used in every home in America. He also gave us the phonograph, moving pictures and storage batteries; the list goes on and on. Edison had 1093 patents when he died, a record that has still not been broken. Perhaps most significantly, Edison’s Menlo Park was the “think tank’ model for scientific research that is still used today. Henry Ford did not invent the car, but he made it so that a car could be owned by every American. Until Ford streamlined car manufacturing, automobiles were only considered luxury toys for the very rich. Henry Ford made it affordable. He also contributed to the future of manufacturing in America by devising the assembly line. He promoted the building of roads and saw to it that gas stations were available to his customers. Harvey Firestone did not invent the wheel, but he did figure out how to make one out of rubber, producing a durable product that made for a smoother and safer automobile ride. He worked with Henry Ford, establishing the network of roads and made the transportation of goods via trucks possible, changing the way business was done in America. As for John Burroughs, the eldest of these friends, he was known for his naturalist essays. Burroughs, with his long white beard, was an avid environmentalist and made the study of plants and animals his life’s work. The Vagabonds certainly weren’t roughing it on these camping trips. Clad in three-piece suits, the men emerged from tents having slept on comfortable cots and were served their meals at tables with chairs. In the evenings, the men sat around a campfire discussing science, history and philosophy. Just imagine those conversations! Watch the Vagabond videos. There are number of videos available on You Tube (keyword Vagabond) or through the Henry Ford Museum website. Have the students write an imaginary dialogue that takes place between the famous men over the campfire. Watch and listen to the Firestone Radio Chat recorded during the 50th Jubilee celebration of the light bulb (You Tube). This is a discussion about the potential of young people. The three famous scientists give advice for success. Afterwards, have the students write about the discussion. Is the advice the men gave still valid today? During his lifetime, Thomas Edison filled 3500 notebooks with his ideas for inventions. His “muckers” (the scientists who worked at Menlo Park) had free access to the notebooks and often added notes. (This was one of the innovations of the ‘think tank.’) If they used an idea, they signed their name. Your class can make an inventor’s notebook! Have each student contributes a design for an invention. Once the book is complete, let the students read through it and add notes to each other’s designs. Have the students research the scientists and create a Venn-Diagram. John Burroughs was one of the country’s first environmentalists. How do you think he would feel about the effect automobiles have had on our environment?